Car Care Month, AAA is urging motorists to heed their car’s cry for attention and be aware of the red and yellow indicators on the instrument panel that illuminate to let you know when a problem occurs. 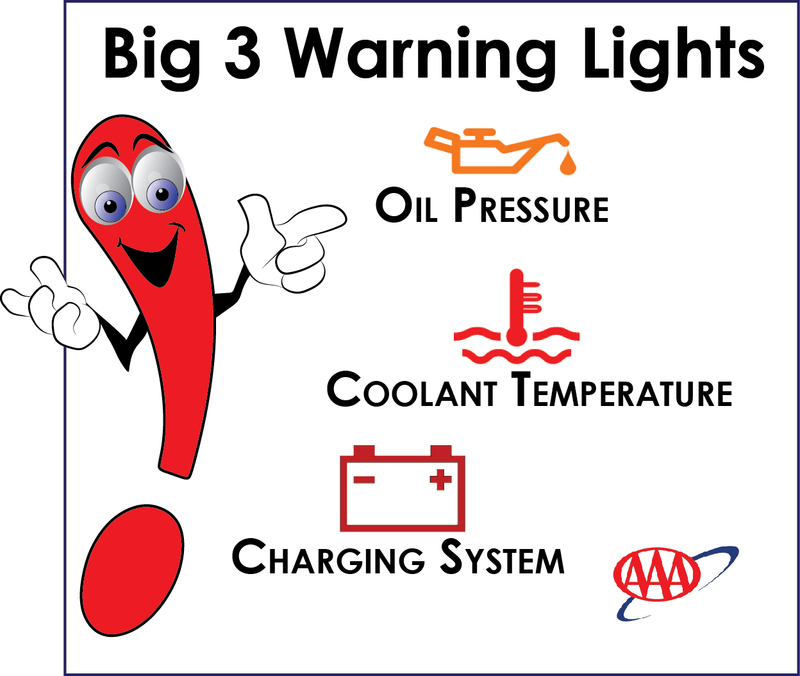 To help motorists better understand the important role of these three warning lights, AAA provides a brief explanation of each. When the ignition key is first turned to the ON position, all of the vehicle’s warning lights should illuminate. The “big three” lights typically remain on until the engine is started and running. If a warning light fails to illuminate at this time, have the related system checked out at a AAA Car Care Insurance & Travel Center or a AAA Approved Auto Repair facility. Once the engine is running, all the warning lights should go out within a few seconds. If any light remains illuminated, consult your owner’s manual or the sections below for further information. The engine oil pressure warning light commonly displays an oil can (“teapot”) symbol or the logo “OIL”. When the oil pressure warning light illuminates, the engine has lost its supply of pressurized lubricating oil and severe engine damage or catastrophic failure can occur within seconds. Of all the warning lights, the oil pressure light indicates the greatest potential for serious mechanical damage, and also allows you the shortest time in which to take appropriate action. If the oil pressure warning light comes on and stays on: pull off the road immediately, shut off the engine, and call AAA to have your vehicle towed. Unless you are in an extremely dangerous situation, do not attempt to drive the vehicle any farther. This can significantly increase the extent of any engine damage – turning what may be a minor repair into a complete engine replacement. The engine coolant temperature warning light commonly displays a thermometer symbol or the logo “TEMP”. When the coolant temperature light illuminates, the engine temperature has exceeded the safe maximum. Until the rise in coolant temperature is reversed, the engine will suffer accelerated wear. If the increase in temperature continues, major engine damage or catastrophic failure will result. The coolant temperature warning light is second only to the oil pressure warning light in indicating the potential for serious mechanical damage. However, the coolant temperature light does give you a little more time to take appropriate action. If the coolant temperature warning light comes on, quickly assess the situation. Steam or liquid coolant coming from under the hood are clear indications of overheating and/or a leak. Pull off the road at the first safe opportunity and call AAA for assistance. A lack of steam or leaking coolant does not mean it is safe to drive the vehicle. Continuing to operate an engine with an illuminated temperature warning light will result in a major damage and a significant repair bill. Caution! Boiling coolant can cause severe burns! Do not attempt to open the hood in the presence of excessive steam, and never remove the radiator cap when the engine is hot. The cooling system is under pressure and scalding coolant will be expelled with great force. The charging system warning light commonly displays a battery symbol or the logo “ALT” or “GEN”. When the charging system warning light illuminates, the vehicle electrical system is no longer being supplied with power by the alternator. A charging system failure rarely results in serious mechanical damage, and of the “big three” warning lights, this one gives you the greatest amount of time to take appropriate action. Depending on the electrical demands of your vehicle, and the reserve capacity of its battery, you will generally have at least 20 minutes of daylight driving time before voltage drops to the point where the ignition system will no longer function and the engine will quit. If the charging system warning light comes on, turn off all unnecessary electrical accessories and drive to the nearest repair facility to have the vehicle checked.